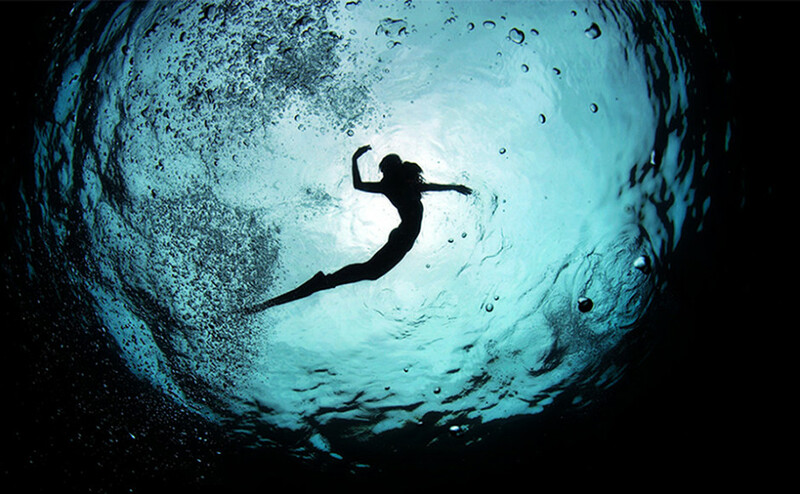 Ai Futaki describes herself as an “underwater harmonist” who expresses and shares the beauty of the underwater world through imaging, modeling and underwater performance”all created while freediving. Japanese freediving master and record holder who has developed a unique style of breathhold videography and photography Ai draws inspiration from the traditional female Ama (pearl divers) of her homeland. She now devotes her life to filming her experiences and sharing her gifts with the world. This past spring Ai visited Wakatobi Dive Resort and discovered an underwater setting that was ideal for sharing and showcasing both her apnea diving and imaging skills. At Wakatobi, some of the finest and most pristine reefs in the entire Indo-Pacific are located less than 60 yards from the resort’s beach, with crests rising to within a few feet of the surface. It was on these reefs that Ai shared essential freediving techniques with Wakatobi’s guests, helping them unlock their own natural talents. Several divers surprised themselves by discovering that with the proper breathing technique, they were soon comfortably freediving to depths of 10 to 20 meters. Often, those who Ai coaches do not believe they can reach depths of 10 meters or more on the first day, she says, and it is quite rewarding when they discover the potential within themselves. Like many accomplished freedivers, Ai incorporates yoga into her practice; she is a yoga instructor trainer certified by Yoga Alliance, an international agency. A core tenant of yoga is to heighten awareness and control of the breath, and this is why many of the world’s leading freediving masters incorporate meditation and yoga into their training. Ai blends the two disciplines holistically; for her, the objective is not about setting records or winning competitions. Instead, Ai’s philosophy is about discovering and expanding personal boundaries, and engaging the underwater realm in the most primal and natural way. Wakatobi’s singular combination of abundant sea life and dramatic shallow-water topography also provided the ambient light setting and rich backdrop Ai used to create this artful video. Look how elegantly Ai glides through a rising ring of air without breaking the tubular bubble. Watch it and you’ll see why Ai considers freediving to be an expression of underwater harmony. 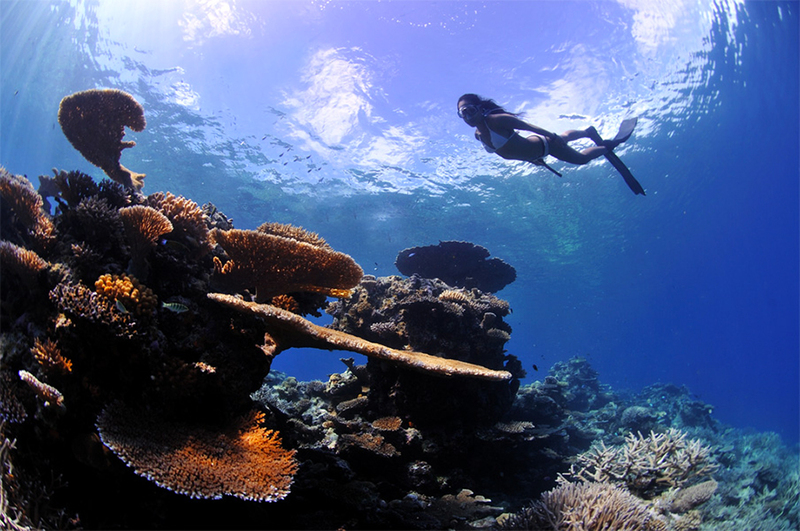 Wakatobi Dive Resort is widely regarded as the world’s premier tropical diving and snorkeling destination. Our resort is located on an island in Southeast Sulawesi, Indonesia, a region known for having the greatest marine bio-diversity in the world. Wakatobi has won awards and is internationally renowned for its social and ecological programs, and continues to protect the pristine reefs of the region with a self-funded marine reserve. Wakatobi Div Resort blends nature and luxury, with 28 bungalows and villas situated on a secluded beach. Direct charter flights from Bali to the resort’s private airstrip provide convenient access to this otherwise remote and natural location.